Winners of the Nobel Prize are awarded a Nobel prize medal, an elaborately decorated diploma, and a variable amount of award money. Have you ever wondered whether the golden medal is really gold or how much it’s worth? Here are interesting medal facts to answer your questions. Yes, the Nobel prize medal really is gold, although its chemical composition has changed over the years. Medals made before 1980 consisted of 23 karat gold. Medals made since then have been made from 18K green gold that has been plated with 24K gold (pure gold). Green gold is an alloy of silver and gold. The natural form of the metal is called electrum. Mixing the two metals yields gold with a greenish cast (hence the name). 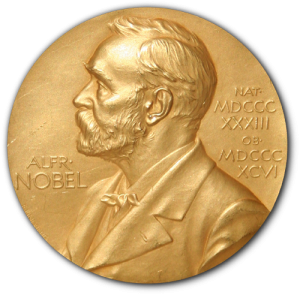 How Much Is the Nobel Prize Medal Worth? The size, weight, and value of the medals varies from year to year. Modern medals average around 175 grams (0.386 lb) per medal. The diameter of the meal is always 66 millimeters (2.6 inches), but the thickness ranges from 2.4 mm to 5.2 mm. The cash value of a medal depends on the current value of gold and the interest in the laureate. The value of the gold in the medal is approximately $10,000. However, the medals are worth much more if they are auctioned, due to their historical value. which means “inventions enhance life which is beautified through art”. Erik Lindberg designed the design of this medal. 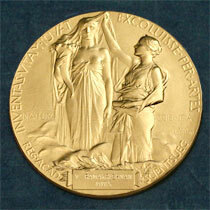 The design of the Economics medal and Nobel Peace Prize varies. Because they are made of gold, Nobel prize medals are a target of theft. The most famous story about protecting a medal is from World War II. German scientists Max von Laue and James Franck had been awarded medals. The medals were sent to Copenhagen to keep them safe, but Germany invaded Denmark, so Hungarian chemist George de Hevesy dissolved the medals in the acid mixture called aqua regia. The gold was recovered from the solution after the war ended and the medals were re-cast. Rinse off the gold and melt it to re-cast it!